The 7250 series liquid level sensors have an inherently lower cost design which results in savings. The 7250 Series digital stiks take field proven magnetostrictive sensing technology and packages it for greater reliability and easier installation. This liquid level sensor is ideal for liquid level monitoring, interface level and leak detection in a variety of liquid media in above ground and underground storage tanks. It was designed to meet EPA Leak Detection and API Inventory Monitoring requirements and has been approved for use in hazardous environments. The 7250 Series is series has an inherently lower cost design which results in savings. It provides the same performance and reliability as sensors that consume more power. It is available in two models. The 7250V liquid level sensor featues flexible and semi-flexible PVDF (polyvinylidene fluoride) sensors and is available in lengths up to 70 feet. This model is ideal for use in tanks or installations where overhead room is limited. The PVDF makes the sensors an excellent option for monitoring chemicals not compatible with stainless steel. 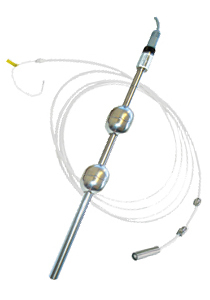 The 7250X liquid level sensor is constructed of 316 stainless steel and comes with a variety of connectors, including a mini connector for quick connect applications, a single 3/4” NPT that can be used with a compression fitting, a double 3/4” NPT for mounting with a flange or bushing, and a 1/2” right angle for use in low overhead applications.